Just after some further advice please. So my 356 engine is new to me, its been in a lockup for around 40 years and apparently turned over regularly alongside a couple of other engines. I merely cleaned it up and installed it, hoping it would run - which is does. I've spent a few weeks of spare time adjusting valves (twice to be sure) and rebuilding distributor, adjusting timing to be spot on. Cleaned the carbs on the Outside, but never opened them. The issue I have is that is smokes light grey smoke from the muffler all the time and if you blip the throttle you get a slightly larger cloud of smoke. This isn't a ridiculous tonne of smoke, but its constant and it gets on my clothes and stinks the garage/area out! Someone suggested worn piston rings or stuck valves - So I brought a compression tester and checked this tonight. I have Approx 6.2Bar/90lbs on cylinders 1,2,4. And 6.8Bar/100Lbs on cylinder 3. So is this Bar/Lbs ok for my 1600 engine (with 32 NDIX carbs) and if so, could the fault be with the Carbs? Or is there still likely to be a problem with piston rings/valves? EX Cars- 53 T2 Barndoor, 55 T1 Standard Golde, 56 T1 Golde, 69 T1 Wizard, 74 Porsche 914, 85 911 Targa. The car was likely put away for a reason. A leak down test would tell you more. It could be stuck rings. Was the compression test done with the carbs open? This makes a big difference. It sounds like a stuck float needle valve in one of the Zenith's, I have been rebuilding one myself today. There is a way to check the float level on them but basically, fuel level needs to stay about .728" from the top of the bowl. I would just order rebuild kits with long accelerator pumps. Pelican Parts. Make sure the floats are working. Best to just pull both and do a good cleaning on them. I have seen the float bowls in them get this white oxide build up that the float drags on too. That would probably require sandblasting them. My 1971 Bus Engines: W-100 Cam, Webcam 118, Webcam 163 my current daily driver and Porsche 924S For Sale! 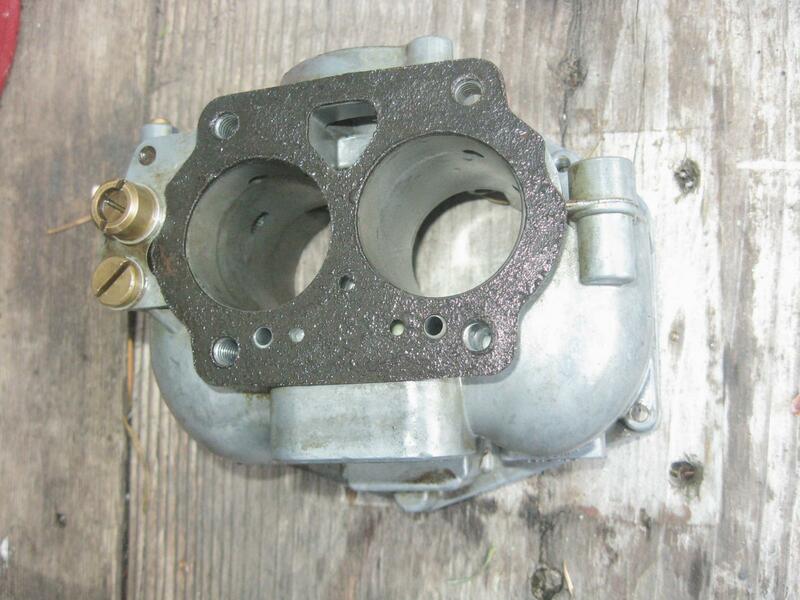 so Ive just ordered two rebuild kits plus a pair of needle valves..
and some carb cleaner and petrol. I'll remove these over the weekend, give them a full service and let you all know how I get on. I'll also restest the engine tonight with the Comp Tester, but this time with my foot on the floor so the carbs are open - I'm expecting to see a higher Bar/LBS....! On a healthy VW air cooled engine one would expect to see 120-130 psi compression. Below 100 psi indicated worn rings or leaky valves. Try doing the test again on those cylinders (engine cold) and note the pressure carefully. Then squirt about 10cc of engine oil into each plug hole (test one cylinder at time) and then quickly do the compression test again. If the pressure now increases a little, the problem is probably worn rings/cylinders. If the pressure doesn't alter, then it's a valve/head problem. The oil helps seal worn rings a little, but it does NOT help burned/tight valves or leaking heads -- so this simple test can sometimes tell you where the problem lies. So I did further work on this tonight. I checked all plugs on the car compression tester , engine cold but this time I had the throttle open! I saw 12.8-13.2 bar which is 140lbs approx - so I believe this is great news...! ? 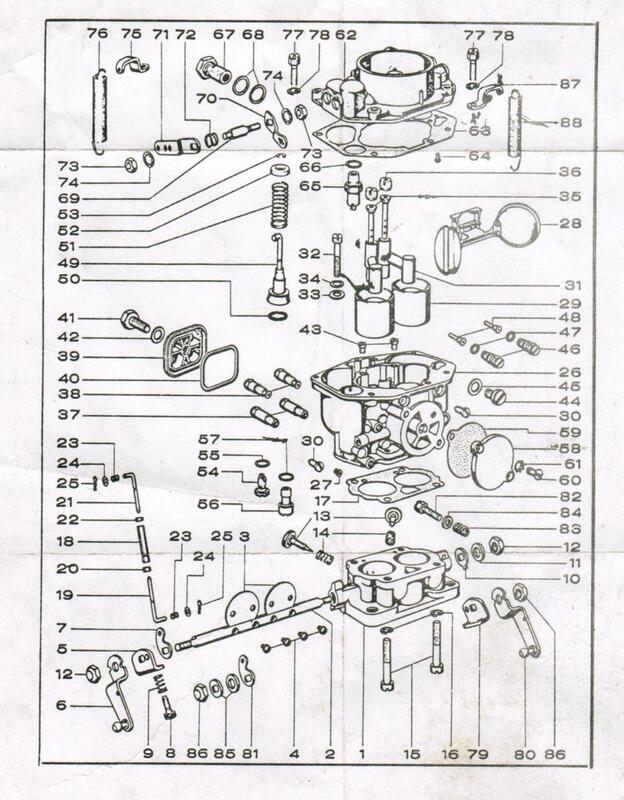 So I then removed the carbs, I had a quick look and notes these points. There was a lot of petrol on the lower gasket when I removed the carb, soaking wet. One of the injector nozzles also didn't spray when I give the lever a push. So as I mentioned I've ordered two rebuild kits and two needle valves. So I'll rebuild them Saturday. If anyone has a comments or advice, let me know . Many thanks! The accelerator pump circuit can leak back and cause a delay of fuel to the (accelerator nozzle 48.) It could be a bad (accelerator pump plunger 49) it'self or it could be a clogged (accelerator jet 46 ) or (nozzle 48 ) or a dried out (accelerator jet Oring 47.) The (bottom check valve 56) is a small spring and plunger (located on the bottom of the body below the accelerator pump plunger) that seals against leak back (it could be dirty) The (inlet check valve 54 ) to the accelerator pump is the brass fitting with a ball inside. Stoddard shows them but most likely they just need some cleaning. That white oxide is caused by ethanol in the gas (check your lawn mower carb it's there too) Luckily the Indians here sell ethanol free gas). Are you sure the white clouds of smoke isn't condensation coming out of the muffler? Have you driven it for a couple of blocks then checked for the smoke? The motor has to be warmed up for an accurate compression test, have some one hold the throttle wide open and not let up until the test on all four is done, to keep gas from being pumped in every time the throttle is pressed down. what do the plugs look like? black sooty is to much gas, black and oily is oil burning, white is just right. this would have been the first thing I would have checked. if it is light gray it is caused by oil burning. don't waste your time with carbs. Probably worn valve guides since compression is decent. accelerate to 4000 rpm in 2nd or 3rd gear and then coast down on the engine to 2500rpm, then hit the throttle. If it puffs light gray smoke you have worn valve guides.